With the roll-out of its High 5s priorities and an new Development and Business Delivery Model (DBDM) in 2016, the African Development Bank Group (AfDB), delivered a record US $11.02 billion worth of projects and programs during the year, targeting creation of 630,000 jobs mainly for youths and women, according to the Bank Group's 2016 Annual Report released at its Annual Meetings in Ahmedabad, India on Wednesday, May 24, 2017. In real terms, the 305 projects and programs approved during the year will bring electricity to some of the darkest parts of the continent, unlock growth potential for small businesses, nourish thousands of children, empower young entrepreneurs, and strengthen connectivity between African regions and cities. These are located in the realm of the Bank's High 5 priorities (Light up and power Africa, Feed Africa, Industrialize Africa, Integrate Africa, and Improve the quality of life for the people of Africa) and the Bank's agenda to "transform the Bank to transform Africa." According to the Report, actual disbursements on these approvals reached US $6.3 billion, a 55% increase over the figures for 2015 when approvals and disbursements stood at US $8.68 billion and US $4.15 billion, respectively. "The mixed economic performance among African countries underscores the urgency for structural economic transformation on the continent - to build resilience and drive sustainable, inclusive growth. Fulfilling its role and mandate, the Bank stepped up its support to Regional Member Countries (RMCs) through higher levels of lending and more policy-relevant knowledge," said AfDB President Akinwumi Adesina. The Bank's "High 5s" serve as vehicles for the delivery of its Ten Year Strategy 2013-2022, which aims to foster inclusive growth, and transition to green growth. The 2017 Annual Meetings of the African Development Bank (AfDB) opened in Ahmedabad, India, on Tuesday, May 23, 2017 with calls for greater cooperation between the Bank and India to help drive Africa's transformation. 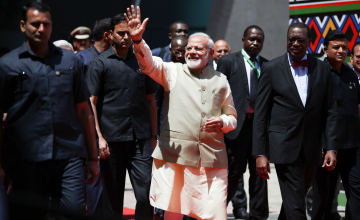 The meetings were attended by over 3,000 participants, including India's prime minister Narenda Modi and visiting African leaders Patrice Talon, President of Republic of Benin; Macky Sall, President of Senegal; and Daniel Kablan Duncan, Vice President of Côte d'Ivoire. More about the AfDB in this BRIEFING. Approvals for Light up and power Africa increased 72.8% to US $ 2.1 billion; operations in the Feed Africa priority rose by 66% to US $1.2 billion; approvals for Industrialize Africa were up 43.5% to US $1.3 billion. The highest approval of US $5.7 billion went to Improving the quality of life of the people of Africa, representing a 52.3% increase while total approvals for Integrate Africa fell 18% to US $675 million. Viewed from the sectoral angle, approvals to infrastructure (comprising water and sanitation, energy, communication, and transport), went up by 43.7% to US $4.81 billion in 2016. The financial sector came second with 23.3%, while projects grouped under multisector activities received 17% of the investments. Agriculture and rural development and the social sector received 9.3% and 6.7% of the total investments, respectively. In terms of financing windows, loans and grants were the key financing instruments, accounting for 92.1% of total approvals in 2016, followed by guarantees (3.3%), equity participation (2.6%), and special funds (2%). The substantial (55%) increase in disbursements are attributable to a range of systemic changes and institutional reforms launched in late 2015, which effectively slashed the time between approval and first disbursement by 96 days. "Strong impacts, both from projects completed during the year and ongoing ones, have been registered in all areas of the High 5s, confirming that the Ten Year Strategy, the strategic priorities, and the new business model, are all delivering for Africa's transformation," the report says. The Report provides a comprehensive overview of the Bank's operations in its 54 Regional Member Countries during financial year (1 January to 31 December 2016). It describes various reforms of the Bank Group to improve its business delivery, effectiveness, corporate management, and highlights the Group's financial performance. ANNUAL REPORT 2016 / Rapport annuel 2016 du Groupe de la BAD from AfDBGroup on Vimeo.